Apple is closing in on 1 billion app downloads and they’re making it a public occasion by putting a counter on their website. They’re offering a decent prize to the person who makes the 1 billionth download. 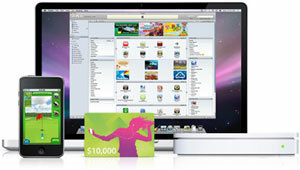 The prize includes a $10,000 iTunes gift card, a laptop, a time capsule and an iPod Touch. No doubt lots of people will be interested in this, this writer included, and many people will be trying to get the 1 billionth download. Having dug under the hood of the counter I can tell you a bit of a secret that will put you at an advantage. Apple’s 1 billion app counter is not actually a live counter but a rough approximation. You can see this in the way it always seems to update at a constant rate. True counters don’t work like this – they come in fits and spurts. Since it is likely that lots of people will be trying to win the competition, the rate at which people are downloading will increase as it gets close to the magic figure of 1 billion. This will mean that that the counter is almost certainly going to be ‘slow’ and behind the real figure. To win you should keep an eye on the text file and consider how close to the top of the hour the 1 billionth app download is likely to be. Factor that the rate will be increasing substantially the closer it gets. Also keep an eye on the website counter as this will be what other people are looking at. Ultimately the 1 billionth app will come before the counter displays 1 billion. Only you can decide how much. I’ll be posting more about this on my Twitter page nearer the time including an update on when I expect it to be. It currently looks like the 1 billionth app will be in about a week. Previous Post Where’s that UK TV Series Shot? I think you’re mistaken about this actually because apple says that they will not be able to see who is the 1 billionth downloader because why else would they have another option so that you can just type your info and stuff. (You don’t need an itunes account to win, you can fill out their entry form on their website).